Go-Go Weisse is one of 3 Stars Brewing Company’s four collaboration beers they did for the Craft Brewers Conference (this one with Other Half Brewing Company in New York). The Go-Go Weisse is a sour beer, with the Berliner Weisse style for good measure. 6.5% ABV. It’s sweet and sour with cherries and cherry blossoms and is oh so so red. 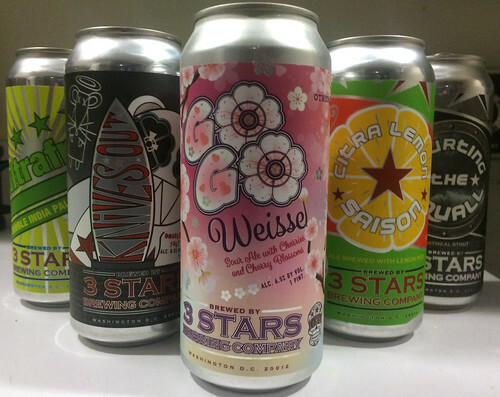 I had it at the 3 Stars tasting room and later picked up a can at Craft Beer Cellar (on H Street NE). I recommend you do the same, as it’s not going to be around forever. I’ve not been a huge sour beer drinker overall, but I enjoyed 3 Stars’ Ricky Rosé last year, so I’m starting to warm up to them.